Real Taste of south India, South India Tour Packages,Packages of south India,Tour packages of south India. Destination covered : Chennai - Kanchipuram - Mahabalipuram - Pondychery - Tanjour - Trichy - Madurai - Thekkady - Cochin - Banglore - Hassan - Sravanabelagola - Halebid - Belur - Mysore. CHENNAI Drive through the Flower & Fruit Market, High Court, Fort Museum, Marina Beach, San Thome cathedral. MYSORE Royal Palace ,Chamundeshwari Temple,Nandi Bull ,Somnathpur Temple. Arrive chennai by International flight. Madras, called "Chennai" in Tamil is the gateway to a hinterland of historical empires, legendary achievements and the great cultural traditions of the one of the world's oldest civilizations. The British came here and developed the area as one of the major ports along Bay of Bengal. Today Chennai is the fourth largest city in India and commands a major share in the trade from South. Chennai completes its pulse as a modern city by offering good hotels to stay, modern shopping plazas and all other modern amenities which are required to be in pace with the ever changing World. You will be met by the representative and transferred to your hotel. This morning you will be given the city tour of Chennai - city tour of Chennai visiting Museum to see the art and bronze gallery (Closed on public holidays). Drive through the Flower & Fruit Market, High Court, Fort Museum, Marina Beach, San Thome cathedral. Leave Chennai for Kanchipuram by road. Mamallapuram (Mahabalipuram) also close to Chennai (Madras) is on the shores of the Bay of Bengal, along the eastern coast. Mamallapuram known for its rocks carvings and monolithic sculptures has the famous shore temple, the only one to have survived the ravages of nature. Also known as the Seven Pagodas (temples), six now lie submerged in the sea. This morning you will be given the tour of Mahabalipuram. Which includes - Krishna Mandapam, Shore Temple and Five Rathas. After breakfast, leave for Pondicherry by road. All the French tradition, the quiet atmosphere of the town influenced by the Ashram of Aurobindo and the beach, make a whole to give to Pondicherry an attractive destination. 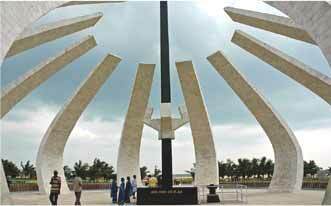 The Union Territory of Pondicherry includes 4 enclaves located in three states of South India. 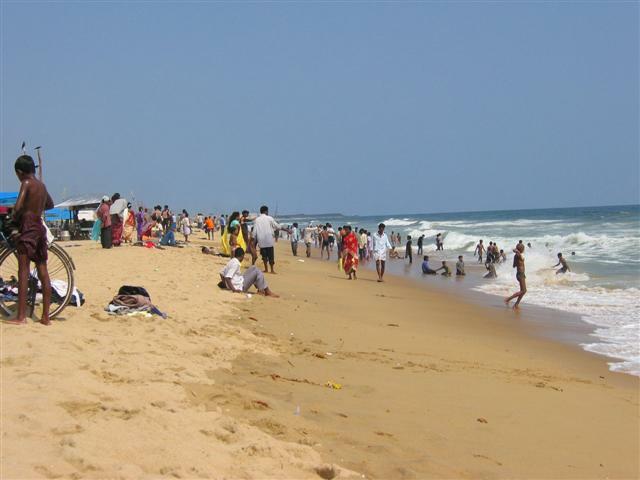 It includes the coastal towns of Pondicherry in Tamil Nadu, Yanam in Andra Pradesh and Mahe in Kerala. The old French colony has retrieved its Indian character, but the scent of the French influence in "Pudicheri" as we call now, can be found again in the red kepis of the police officers, French spelling on signboards and traffic signs and some buildings and old stones. Upon arrival, check-in at hotel. 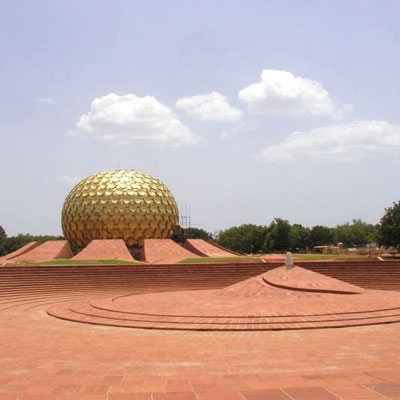 This afternoon you will be given the city tour of Pondicherry. Leave Pondicherry for Tanjore by road. Tanjore (also known as Thanjavur) is the royal city of the Cholas and Nayaks. Thanjavur derives its name from Tanjan-an asura (giant), who according to local legend devastated the neighbourhood and was killed by Sri Anandavalli Amman and Vishnu. Sri Neelamegapperumal Tanjan's last request that the city might be named after him was granted. Chola, Chera and Pandya kings were ruling Tamizhagam even before Mahabharat period. Chola kingdom was leading and patronizing literature, art, science and religion than the other two kingdoms. 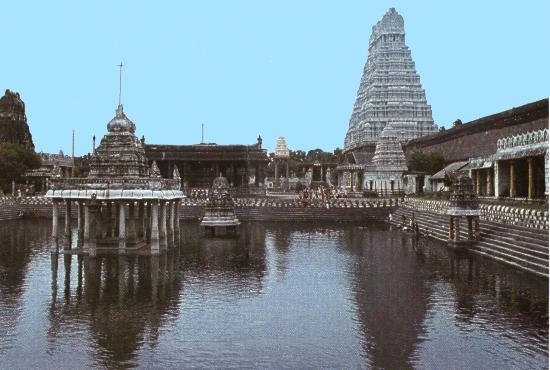 The capital city of Chola was always changing. Thiruvarur was the capital during Manuneethi Cholan. 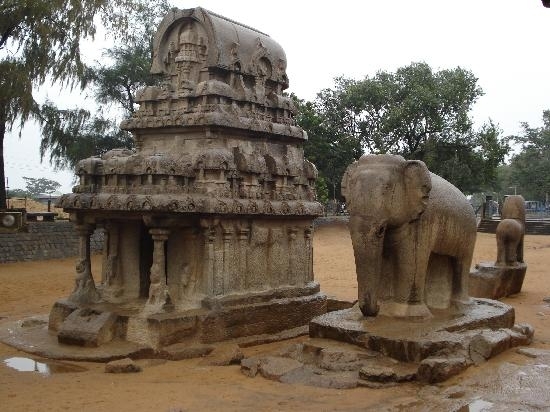 Uraiyur, Pazhaiyarai, Thanjavur and Gangaikonda Cholapuram used to be the capitals of Chola Kingdom. It has been believed from the Epics that many Chola kings were ruling from Thanjavur even before Karikala Cholan. In the afternoon Visit the Brihadishwara temple which was built by Raja Raja and is termed as the crowning glory of Chola temple architecture. This temple is one of the monuments in India with World Heritage listing. Also visit the Thanjavur Palace, constructed in 1550 and has huge corridors, spacious halls, observation and arsenal towers. Leave Tanjore for Madurai by road. Enroute visit Trichy. Trichy (Also know as Tiruchirappalli), situated on the banks of the river Cauvery is the fourth largest city in Tamil Nadu. It was a citadel of the early Cholas which later fell to the Pallavas. Trichy is a fine blend of tradition and modernity built around the Rock Fort. Apart from the Fort, there are several Churches, Colleges and Missions dating back to the 1760s. The town and its fort, now in Trichy were built by the Nayaks of Madurai. This city has given great Tamil scholars whose contributions to the Tamil literature have been very significant. 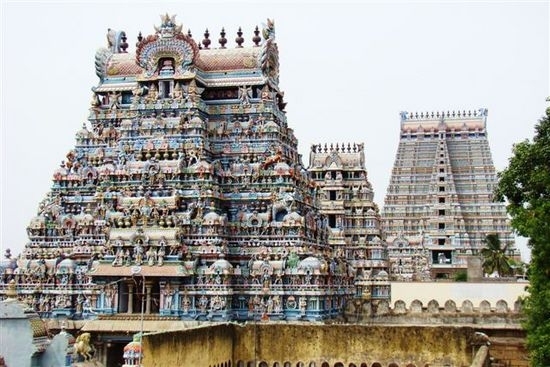 Visit the Rock Fort Temple in Trichy (Tiruchirapalli) and the Sri Ranganathaswamy Temple at Srirangam - This superb temple complex is surrounded by seven concentric walls with 21 gopurams and is probably the largest in India. Most of it dates back from 14th to 17th centuries. The largest gopuram was completed as recently as 1987, and now measures an astouning 73 metres. 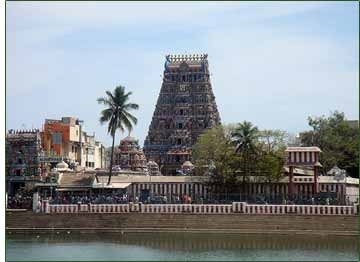 After visiting Srirangam, continue the drive to Madurai. Madurai with 2500 Years old history is the oldest city in Tamilnadu both historically and mythologically. Legend says, Madurai was originally called a forest Kadambavanam. Once a merchant saw INDRA, the king of Devas worshipping a Swayambhulingam under a kadamba tree in the forest.This incident was informed by Dhananjayan (the merchant) to the king Kulasekara Pandian. The king immediately cleared the forest and built a temple around the lingam. And a city was planned around the temple. On the day the city built by the king was to be named Lord Shiva made his appearance. Drops of nectar from his hair fell on the town so the place was named Madurai, the nectar city - Mathuram means sweetness in Tamil. Arrive Madurai and check-in at hotel. This morning you will be given the city tour of Madurai - Visit Madurai's main attraction – Sri Meenakshi temple which attracts thousands of pilgrims from all over India. 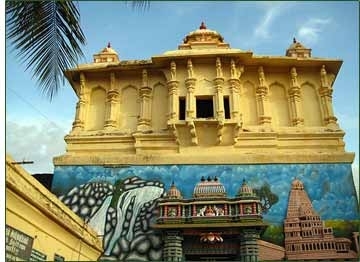 The temple is named after the daughter of a Pandyan King. 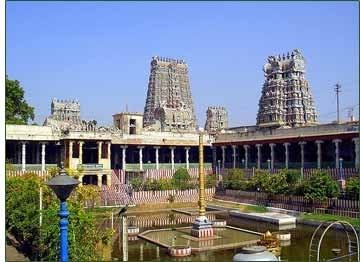 Designed in 1560 by Vishwanatha Nayak, the present temple was substantially built during the reign of Tirumalai Nayak (1623-55 AD), but its history goes back 2000 years to the time when Madurai was the capital of Pandya Kings. Leave Madurai for Thekkady by road. Thekkady - is of historical importance for more than one reason. It has been and still is an important spice plantation area. 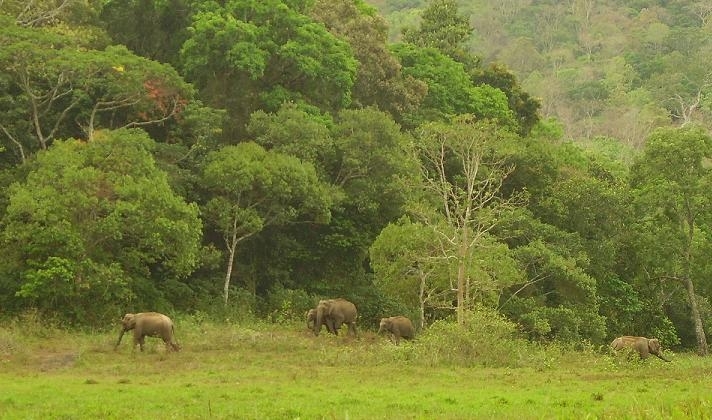 Thekkady is one of the finest known natural wildlife sanctuaries and it has a history dating back to the year 1934, when the then state government took initiative to establish the Nellikampathy Sanctuary. This wildlife sanctuary was later developed into the 780 square kilometer Periyar Wildlife Sanctuary by the year 1950. On arrival in Periyar checkin at the hotel. Afternoon, game viewing by boat at the park. Leave for Cochin by road. En-route disembark from the vehicle at Kottayam to do a very pleasant stretch upto Allepey in boats on the backwaters of Kerala. Disembark from the Boat at Allepey and continue your drive to Cochin. Cochin, Its involvement with the Portuguese, the Dutch and the British are evident in the architecture of city buildings, Modern day Kochi may be a busy port and shipping centre but it has many attractions for tourists. Arrive Cochin and check in at the hotel. This morning you will be given the city tour of Cochin. 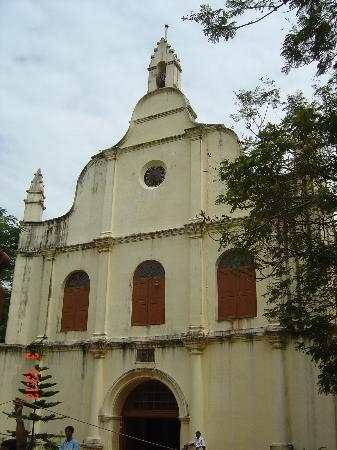 Visit the St. Francis Church, India's oldest European Church was contructed in 1503 by Portuguese, Chinese Fishing Nets, strung out along the top of Fort Cochin, Mattancherry Palace or The Dutch Palace, built by Portugese in 1557, this palace was presented to the Raja of Cochin, Veera Kerala Verma. The palace's alternative name, the Dutch Palace, resulted from substantial renovations by the Dutch after 1663Palace. In the evening you will have the opportunity to witness Kathakali Dance Show. Transfer to the airport in time to connect flight for Bangalore. Bangalore is the capital of Karnataka. It is called the Garden City for it's delicate blossoms and greenery that impart a unique beauty to this lovely city. The weather is the city's best feature, with pleasant summers and bearable winters. Bangalore is a cosmopolitan city, where different cultures and customs exist. Kempe Gowda founded the city in 1537 - today it is a bustling and diverse city, with ancient arts that flourish alongside the Silicon Plateau of India. In Bangalore you will be transferred to the hotel. This afternoon you will be given the city tour of Bangalore, - "city of gardens". Visit, the Vidhan Sudha – It houses the State's Legislature and Secretariat, Nandi Temple – One of the oldest temple, popularly known as the Bull temple. Leave Bangalore for Hassan by road. En-route visiting Sravanabelagola, one of the oldest and most important Jain pilgrimage centres in India, and the site of the 17m high statue of Gomateshvara, said to the world's tallest monolithic statue – an important Jain religious centre – a colossal Gomateshwara statue. Continue your drive to Hassan. Hassan is a picturesque town in the heart of malnad with a pleasant climate, is about 180 KM from Bangalore, the capital city of Karnataka. The Hoysalas brought world wide acclaim to the district through their unique style of Architecture. Arrive Hassan and check in at the hotel. In the afternoon, excursion to Hoysala Temples of Halebid & Belur. 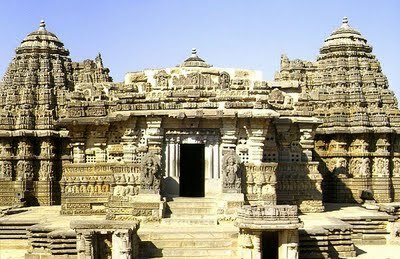 Visit the Hoysaleswara Temple at Halebid which is the most outstanding example of Hoysala art. 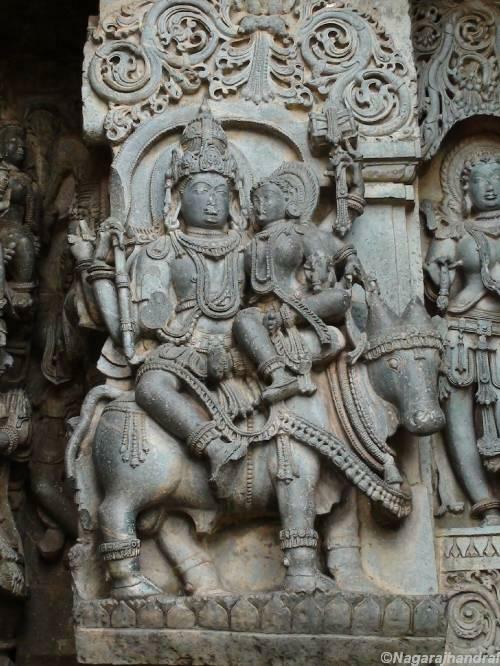 At Belur, visit the Channekeshava temple is the only one at the three Hoysala sites still in daily use. Morning leave Hassan for Mysore by road. Mysore is a city of palaces, gardens, shady avenues and sacred temples and retains some of the charm of the old world with its many institutions that propagate Karnatic Classical music and dance. Mysore was the political capital of the Wodeyar dynasty which ruled the state of Karnataka for some 150 years till the independence of the country from the British. These kings were great patrons of art and culture and Mysore was the cultural capital of the south under the rule of the Wodeyars. The Wodeyars made the Dasara festival an event. Arrive Mysore and check-in at hotel. 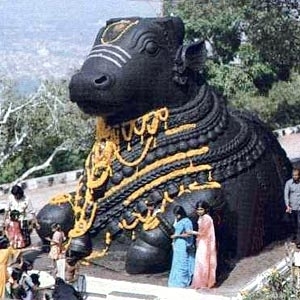 Afternoon, visit the magnificent city on the foothills of Mount Chamundi. 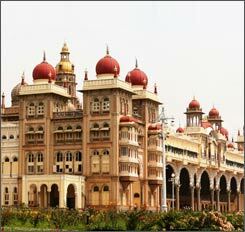 Visit the Mysore Palace, also known as the Amba Vilas Palace, this palace was the seat of the Maharajas of Mysore. Burnt down in 1897, the present one was completed in 1912, at a cost of Rs. 4.2 million; Chamundi Hill - overlooking Mysore from 1062m summit of the hill is the Sri Chamuneswari temple. Today after breakfast we move towards Somnathpur temple 45 km from Mysore, the temple built in 1268 AD is known for its Hoysala architecture. The temple is seated on a star shaped base, set on a chiseled plinth and guarded at intervals by miniature elephants. The temple wall depicts scenes from Ramayana, Mahabharta and Bhagvata. Later on, after lunch we continue towards Chennai by train-the capital city popularly regarded as the 'Gateway to the South' represents a culture that is distinctly different from that of northern India. Our tour conclude:Real Voyages thanks you for your patronage & look forward serve you again in near future.